The Monkees, perhaps, are the best example - or worst, depending upon your point of view - of a manufactured pop group who scored significant chart success. But The Strangeloves aren't that far behind. The Strangeloves were 3 guys from New York who said they were former sheep farmers from Australia. Their story went that they got rich over a new form of sheep crossbreeding and used their millions to start a rock group. Bob Feldman, Jerry Goldstein and Richard Gottehrer, at the time succesfull record producers, adopted the monikers Giles, Miles and Niles Strange and a musical conceit was hatched. The fictitious brothers ran into a bit of a problem in 1965 with the success of I Want Candy. It ranked so high on the charts the demand to tour as live artists forced them to send out the session musicians who performed in the studio. But they could lip-sync, as this clip demonstrates... Hey, in 1965 what did I know. I was 13 and I thought they were kinda cool. 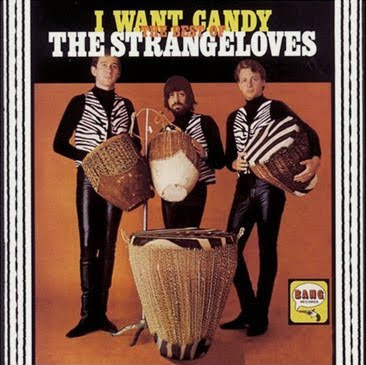 The Strangeloves were pretty much a one hit wonder, releasing their first and last album, also titled I Want Candy, in 1965. This post first appeared on dufusdownbeat November 2009. This is my Theme Thursday post. Dance on over and see how other bloggers have approached "candy" the theme for this week. Very interesting! I just love pop culture trivia, and I never knew this! I was crazed over The Monkees, The Cowsills, Greg Brady...LOL. Typical little girl enjoying the eye candy! Great post! Kathy: Glad you enjoyed it. When I saw this week's theme I thought this post was a natural. Haha! As soon as I heard this Thurday's theme, that song immediately came to mind! Nice post! 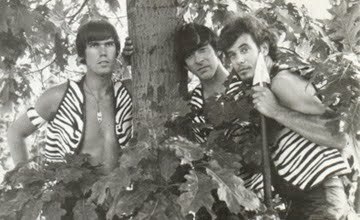 Don: At least with the Monkees you knew up front they weren't musicians, except the guy in the toque - hell Micky Dolenz was Circus Boy. But I didn't find out about the Strangeloves until I researched this story last year. 00dozo: Great minds think alike! Didn't Bow Wow Wow cover this song in the early 1980's. The leader singer was on a beach, she had a shaved head. RA: Glad you enjoyed this. If you like discovering music you should follow my music blog "dufusdownbeat". You can click through from my right-hand sidebar. lotgk: I don't know about the video but you're right about the group Bow Wow Wow covering the song. Way to go! Dufus, downbeat is just my cuppa! Can I follow it by not going through facebook? what a unique take on the theme and an intriguing story to boot...kinda precursors to milli vanilli...happy tt! RA: Yeah, sure. Click on "dufusdownbeat" in my right-hand sidebar, then when you get there just bookmark the URL. Glad you like it. Brian: Thanks. Yeah, except these guys were better than Milli Vanilli, eh! What a great twist on the candy theme. It's funny how this song name to mind at the exact moment I read the theme. I even mention it in my TT. ha! I, too, thought of Milli Vanilli. I still have a few tricks up my sleeve. I vaguely remember that song. I'd forgotten about go-go boots, though. Fun video! Monkey Man: Yeah, the prompt did the same thing to me. It was a catchy tune. I never knew Bow Wow Wow did a cover version of "I want candy." Who knew? Also too, I LOVE the dresses of the Go-go dancers. Quirks: You really can be cheesy sometimes. Ha, ha, ha. PattiKen: You forgot about Go Go Boots? What about Deygo Boots? Wherever you go Deygo. Kelly: You gotta love the 60s. I used to watch this show, although it lasted only 1 season and I remember watching this particular performance. I'm old enough to remember the song (didn't like it) and amused to read the story. As teenagers during the Sixties, most of us knew the groups were lip synching on the popular shows--everything from American Bandstand to Ed Sullivan. It was so obvious. We didn't usually know the background stories, however, and I wonder how much we would have cared? Milli Vanilli blew lip synching apart in the late 80's...with a tragic ending for them. California Girl: Lip-syncing in the 60s, or later for that matter bordered on the ridiculous sometimes. It made some of the performances laughable, didn't it? Great bit of trivia. Today, however, aren't ALL pop groups manufactured? Seems like it, anyway. Chris: Today? I dunno. I don't listen to any "mainstream" contemporary music and I suspect that's what you're referring to. Like Justin Bieber? What an interesting story. Makes me think of that song "Teen Angel", but I don't remember who sang it. The back story on them was that they were sitting around laughing about the sappy songs that were so popular at the time, and as a joke, wrote the sappiest song they could imagine. It was a ridiculously huge hit, and I'm pretty sure it was their only one. Nicky: Mark Dinning had a #1 one hit wonder with Teen Angel in 1959. His sister and her husband wrote the song. It was banned by many stations for being too morbid. dreamhaven: The film came out in 64 and the song in 65. They may well have copped their name from the movie. Sounds plausible. A great and entertaining history of a group that (along with The Archies) created one of the mosts unforgettable (even if you stuck hot needles through your eyes) songs of the time period. However, I have to defend the Monkees here. First of all, they really did play their own instruments, although not on the original album. Mike Nesmith(whose mother invented White Out) had been performing as a musician for quite a while before becoming a pop idol. Following his time with the Monkees, Mike went on to play with The First National Band, a group often considered one of the pioneers of country rock. He became well-known as a producer and created Pop Clips for Nickelodeon, which Time Warner bought and turned into MTV. One of Mike's most famous post-Monkees works was the highly acclaimed Elephant Parts video. Davy Jones, of course, already had a musical career behind him as a singer in England (I used to have one of his albums from this period, which included such songs as "It Ain't Me Babe," and ""Maybe It's Because I'm a Londoner.") Davy was also inadvertently responsible for creating one of the biggest names in rock history when a rising young singer also named David Jones wanted to avoid being confused with the Monkees and changed his name to David Bowie. While it's true that Mickey Dolenze had never touched drums before becoming a Monkee, he learned quickly. He also smoked dope with Paul McCartney, which is pretty good street (if not exactly musical) cred for anyone. Peter Tork started studying piano when he was nine, and went on to become proficient in a number of instruments. Not that I'm a Monkees fan or anything. Oh, and one more thing -- for their American tour, the Monkees took on an amazing, but disastrously inappropriate musician they admired for their opening act: Jimi Hendrix. He lasted a few shows before the throngs of teeny-bopper girls screaming "We want Davy" finally got to be too much and he left the tour. That was supposed to be "Micky Dolenz," not "Dolenze." I'm always reminded of him when I see Matthew Perry ("Chandler" on Friends). Frank: Hey, I'm a believer! That last part about Jimi Hendrix was hilarious. Nevertheless, the Monkees remain a manufactured pop group pulled together for the express purpose of the TV show. I watched the show, yet never bought a Monkees record. Did you know the show was supposed to showcase the Lovin' Spoonful? Apparently there were contractual problems so the producers ran a newspaper ad to cast individual members. Did you know Stephen Stills was among the try-outs? After he was turned down he formed Buffalo Springfield with Neil Young. Michael Nesmith? I have two of his solo albums and two by The First National Band. Good stuff. Oh, I loved The Monkees. I remember swooning along with every other 7th and 8th grade girl over Davey Jones. I loved all their songs. Daydream Believer, I'm a Believer, Last Train to Clarksville, Mary Mary...ahhh the memories. Leeuna: I was a little older, and a guy. I wasn't a big fan but they sure were popular! I'm a guy and I was a little older too, so if I said I had all their albums up to and including The Birds, The Bees & The Monkees that would kind of be a bad thing, right? And when I said I had that Davy Jones' 1965 album, titled David Jones, from his pre-Monkees days when he was singing music hall songs in England -- complete lie. Never happened. And I didn't have Monkee shoes by Thom McCann either. Nope. Not me. Come to think of it, I've never even heard of the Monkees. Who are they again? Frank: It's okay Frank. There, there.